I love any type of beauty treatments, especially for my face and skin. That's why I was so excited to do a review for Exuviance Rejuvenating Masque. It contains Alpha and Polyhydroxy Acids offer anti-aging benefits to decrease lines and wrinkles and plump the skin in a powerful peel off. It was also name Instyle's Best Beauty Buy! Here's my thoughts after using it a few nights ago: When I 1st put it on, I had just washed my face and neck, so it stung a little while I put it on. Nothing harsh, but because my pores were open, it did have a stinging sensation. After putting it on, I waited 15 minutes to peel it off. Once I went back to peel it off, it was pretty easy to come back off. I was able to peel most of it off, and the part around my hair line and neck that were harder to get off, rinsed off easily with a little warm water. Right after it wasoff, my face felt thoroughly cleansed and looked smoother. The next morning I looked in the mirror and my skin actually looked much smoother. I was so excited! My makeup even looked better on! 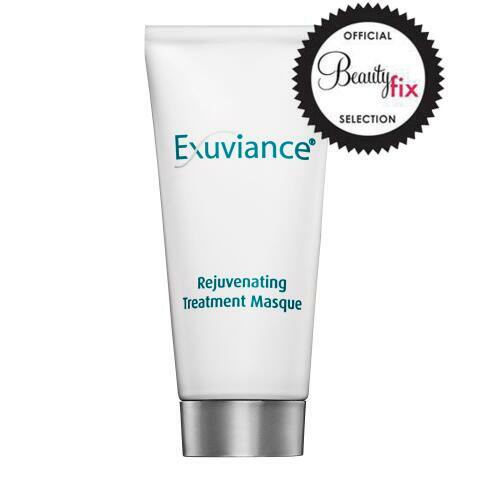 I am a definite believer in Exuviance Rejuvenating Masque!! I plan on using it twice a week to help my pores look better and keep my skin looking brighter and smoother. Disclaimer: I was given the opportunity to review Exuviance Rejuvenating Masque by Noestrata.﻿ I was given the product in order to review it. I was not compensated in any way to give a positive or favorable review. All opinions expressed are that of My Munoz Family!